Nonetheless, our August meeting was indeed grand. Good group of people, including a couple o’ members we hadn’t seen in a while. And one stupendous structure. Hey, get to the photos! Bill does very well for himself by buying this Hot Wheels 20th Anniversary 3-pack. No idea what the CW/CP price tag represents. Circus World, maybe? If you know, share in the Comments! Twenty years, and only three cars? That’s … not too productive. Sorry for the glare and shadows. This is actually the last photo I took, before my camera’s battery went out. …But unfortunately as I was setting it up, I broke it. I’m such a bad person. A bit of a departure here: Some nose art on a Midnight Otto. I mean, it’s on a door, but still … nose art. Ed was at the meeting. It’s always good to see Ed. He’s a great guy. But I wish he’d bring some stuff to the meetings once in a while. He never brings nothin’! And I mean — NUTHIN’! …Because it usually has a Volkswagen Drag Bus shell wrapped around it. Mike C. has been absent from the club for the last few months. He made a delightful surprise appearance at our August meeting. Looks good, sounds good. And to make his return complete, he bought some items. A few. You know, three or four. Some of Ed’s nuthin’, and some of BTM’s nuthin’. Big Tractor Mike bought this set from Ed (leaving him with nuthin’), which features a Batman “action guide”, and three Batman-themed vehicles: one of the over five hundred eighty six variations of the Batmobile; a Joker-themed Evil Twin (a sly choice for comic book aficionados), and a Bane-themed whatever that is. Original Ken picked up this lovely Mercedes 350 SL (Majorette, 1/60 scale), which I actually thought he bought at the previous meeting, but no. Man, I dig those reflections. Well-appointed interior, and an opening trunk, which is always nice. Plus a few nicely embossed — if somewhat overscale — surface details. 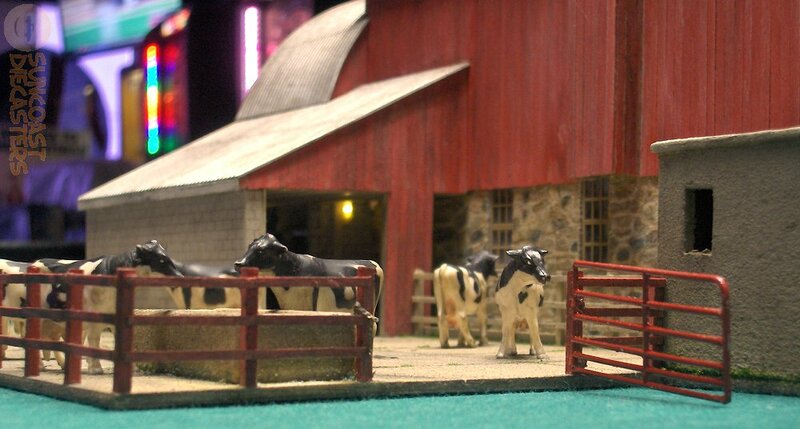 And now for the Big Thing of the Meeting: The Grand Barn, a custom hand-built replica of an actual barn, by Doug. I don’t know what scale Doug built it at; nor did I ask him to place his hand in the photo. He was discussing the barn with another member, and just happened to point out a feature right before my camera’s timer fired. A lucky accident, as it gives you some idea of the size of the model. For additional reference, Doug is 9’12” tall. 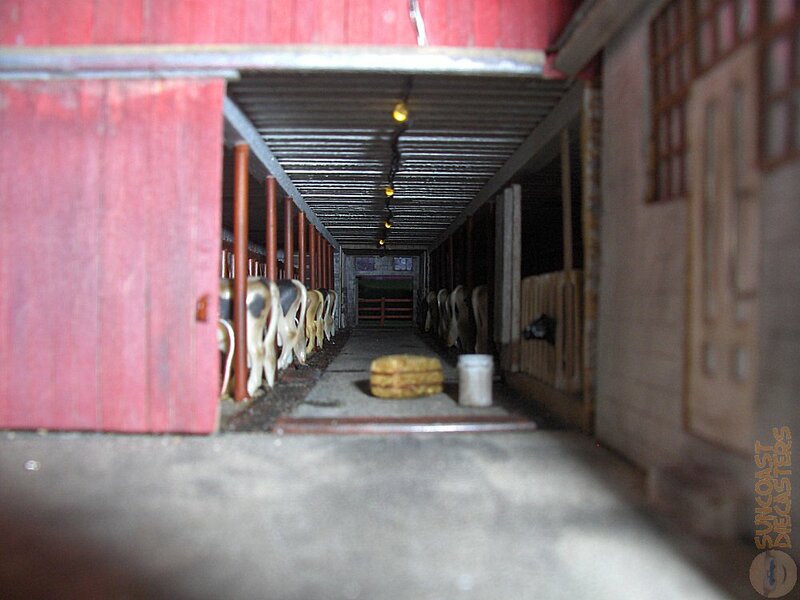 I call it the Grand Barn for several reasons, such as its sheer scale, and its incredible detail. Click below for sheer scale. Size: 1000 x 486 pixels. This build is loaded with details. Details such as the pallet leaning against the wall. See the small sub-building on the right? It will become important later. Size: 1000 x 562 pixels. Note the gleam just off the right of the nose of the contented cow on the left. That’s light reflecting off the artificial water in the trough. Yes, artificial water, a product used to add yet another touch of realism. The staining around the base of the trough indicates these are some sloppy Santa Gertrudis. Note the real metal chain on the post in the above photo. It’s used to shut the open gate in the below photo. And yes, you *are* seeing an actually lit light. Size: 1000 x 536 pixels. Ha! I’m foolin’! This is actually the storage shed in back of the Sports Bar. Fooled you twice! 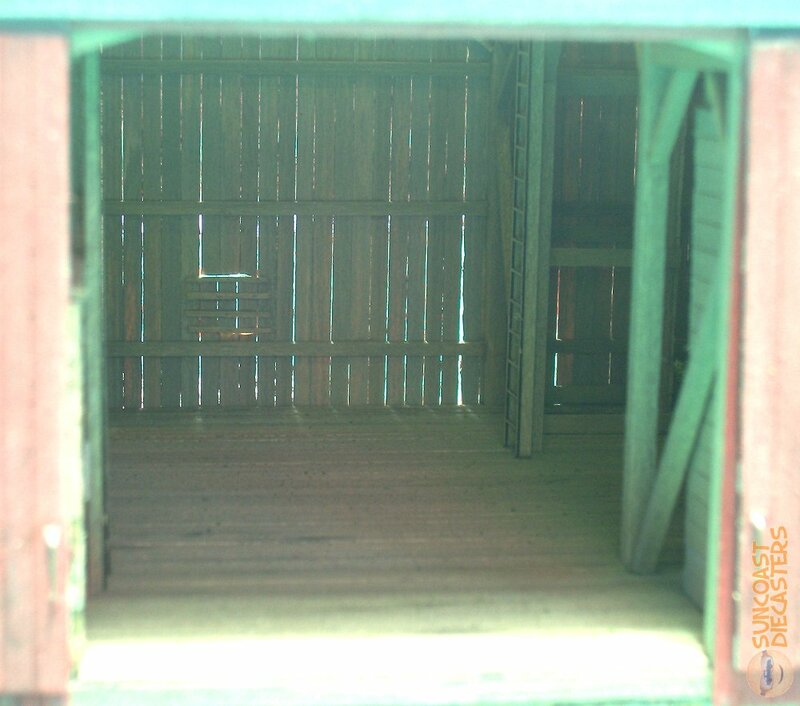 It really is a shot of the upper interior, as you can see in this farther-backly photographed photograph. And if you still doubt me, compare the light spill between the boards in both pics. You’ll see they match. Size: 1000 x 882 pixels. How’s this for detail? Lightning rods! Not to mention that double-hung window. More evidence of Doug’s attention to detail: Each piece of this door is hand-cut, and the hinges work. It’s also evidence of his patience: That door is *barely* the size of a postage stamp. Remember that sub-building I mentioned earlier? I wanted a shot of the interior detail, so I set my camera on the table with the lens just outside its door. Didn’t turn out as I’d hoped. No idea how I got a nicely focused shot of the far fence *and* light smear like someone kicked my camera. …Ten seconds later, I got the shot. The modified flash setting lit up the interior details nicely while also creating rich shadows, and you can still see that the lights are lit. Let me emphasize: This shot was taken with my camera’s lens *inside* the doorway. Size: 1000 x 750 pixels. 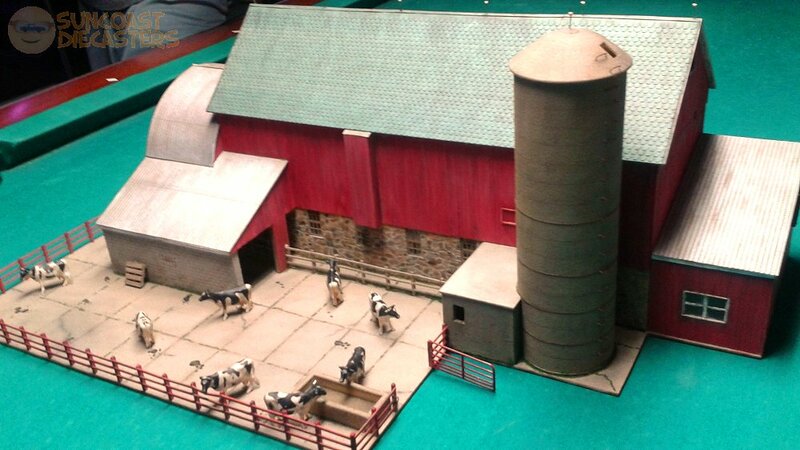 For its size, its realism and its astounding and near-overwhelming quality of detail, Big Tractor Mike and I declare Doug’ custom hand-built Grand Barn to be Suncoast Diecasters‘ Find of the Month(*) for August 2018! Many congratulations, Doug! See you at our September October meeting! This entry was posted in Book, Composition, Majorette, Vintage Price Tag and tagged Batman, Composition, Diorama. Bookmark the permalink. ← July 2018 features a Golden Anniversary!